We’ll continue our RhymesTime sessions at Gastown café Macclesfield Monday mornings 10.30am. See you Monday 31st July, we’ll take a break through August but return Mondays in September. Join us for some fun in the park on August 15th with our ParachuteTime at West Park. Starting in September: Wednesday mornings Open The Door…to PlayTime! We’re delighted to be able to bring you a combined ‘class & social’ time based at the Tytherington Family Worship Community Hall. Drop in at any time during the morning. 11.00am Say Goodbye & Community Hall closes. Follow us on Facebook to keep up to date with all our activities. Don’t forget that in all our sessions we use music & movement to stimulate the brain which in babies & young children promotes discovery & learning. They can be tailored to suit your individual needs if you have a group which would like to meet for an activity, a special occasion or social gathering. We can organize party entertainment & even bring our StoryTime to you! We’d love to hear from you & be alongside you & your friends. 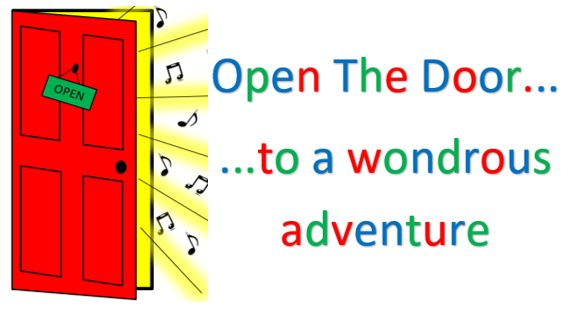 We would like to thank Tytherington Family Worship for their ongoing support to our Open The Door Activity Programme & would encourage you to have a look at their Website & Facebook Page & see what interesting activities take place 7 days a week. There are fun groups for children, but also adults enjoying everything from table tennis to art & you’re invited to get involved too. So, if you have family members & friends who you think might be interested there are various leaflets/flyers available. Thank you for all your positive feedback & support.